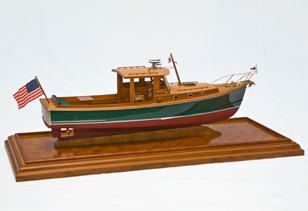 Classic Yacht Models is renowned for their artistry of some of the world’s finest custom yacht models. Each exclusively commissioned vessel is impeccably detailed, perfectly scaled and finely crafted using precious woods, golds and diamonds. Previous projects include the notable 154′ Perini Navi ketch Andromeda La Dea, the Herreshoff schooner Mariette, sailing motor yacht Atlantide and the modern clipper yacht Maltese Falcon.